Since the 16-day government shutdown in 2013 — the last time such a shutdown took place — Congress has only once passed a spending bill with more than one legislative day to spare. That was at the end of the 2017 fiscal year, when the House and Senate agreed on a short-term spending bill with 11 legislative days to go before the funding deadline on Sept. 30. Members have generally tolerated the shorter funding bills in the hopes that leaders will soon compromise on a longer-term solution known as an omnibus spending package. These packages circumvent the normal way of passing appropriations measures — known as regular order — where funding bills are passed one at a time out of committee and on the chamber floors. Congress hasn’t done that since the 2006 fiscal year (which required three short-term extensions). Watch - David Hawkings’ Whiteboard: What is Regular Order? The far-right House Freedom Caucus has also proved to be a headache for leaders in their efforts to pass spending bills. Both former House Speaker John Boehner, R-Ohio, and current Speaker Paul D. Ryan, R-Wis., have had to thread a narrow gap between convincing either Democrats or Freedom Caucus members to join their side to form a majority. What’s complicating the process this year is the breakdown in negotiations over spending cap levels and immigrants covered under the Deferred Action for Childhood Arrivals immigration program. President Donald Trump’s threat to end that program has left congressional leaders responsible for deciding its recipients’ fate, and Democrats don’t want to pass a spending bill that doesn’t include protections for them. Democrats control enough Senate seats to hold up the passage of a bill on Friday, and only six Democrats in the House voted in favor of a spending bill on Thursday. 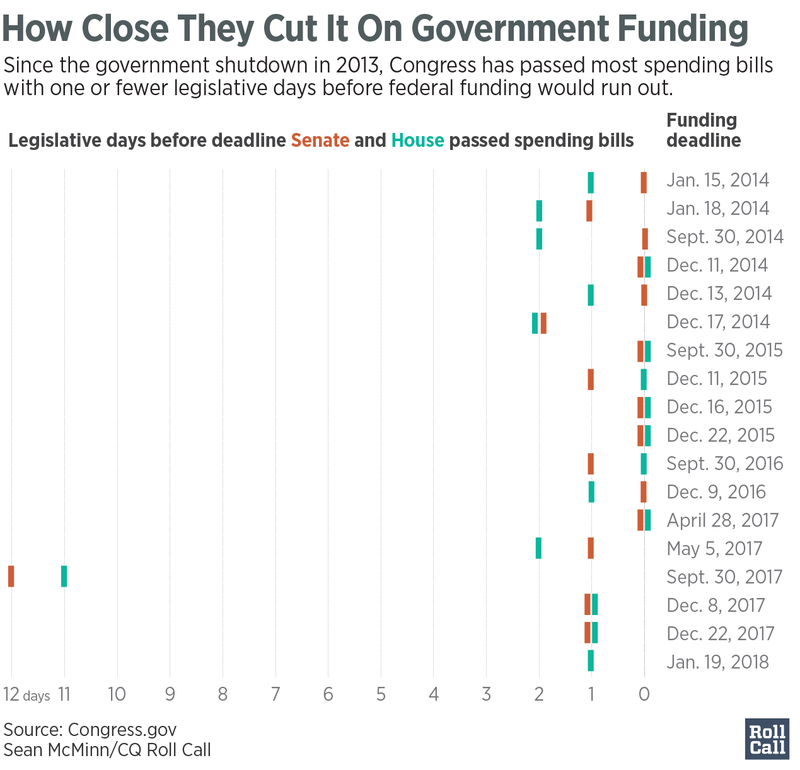 The last time Congress got this close to a government shutdown was in April of last year, when it passed a last-minute spending bill that provided for a week of funding. That allowed party leaders to negotiate an omnibus bill that later passed in May.